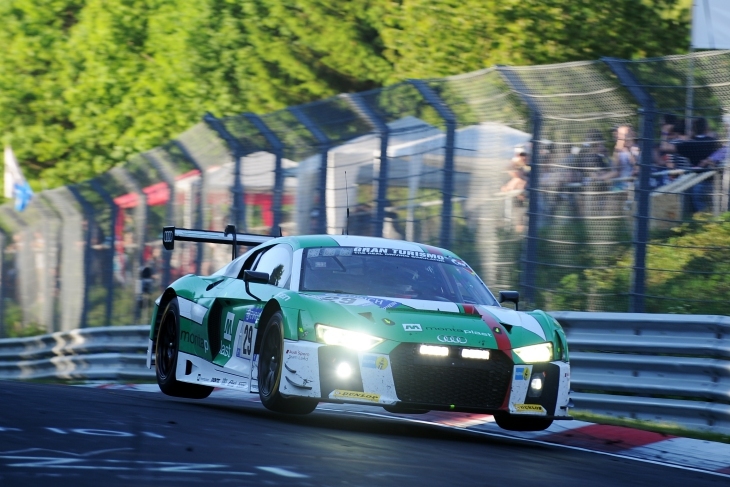 Audi Sport Team Land has taken a dramatic win in the 45th running of the 24 Hours of the Nürburgring, after a series of events turned the race on its head in the final two hours. The winning crew of Chris Mies, Connor Di Phillippi, Markus Winkelhock and Kelvin van der Linde crossed the line just 29 seconds ahead of the #98 ROWE Racing BMW and the #9 WRT Audi in third as the rain came down in the final half an hour, allowing the team to get back into the lead after a software glitch almost cost the team the race just before the final hour. After leading 126 laps of the 158 laps in the race, it looked like Audi Sport Team Land’s #29 crew would cruise to victory going into the final stint, with a comfortable lead of over a minute. But a glitch in the car after its penultimate stop forced van der Linde to bring the car back in for an extra stop to reset a sensor which had caused the car to go into limp mode. It swung back to the team though in a most unlikely fashion, after the heartbreak of the crew members and drivers who thought the race had slipped through their fingers. 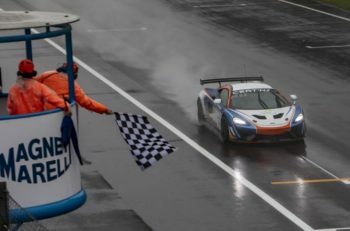 Down to third, the team gambled and took wet tyres on its final stop, Kelvin van der Linde storming back into the lead as the rain came in the final 30 minutes, after a bone-dry week at the ‘Ring. It was a gamble which was only possible though, when the team comprehensively fumbled what was set to be its final stop, the fuelling of the car descending into near farce, prompting Land to take slicks off and put fresh wets on after it knew it had lost them too much time and with rain falling this was the last throw of the dice available. Ahead, the #9 WRT Audi of Rene Rast and the #98 ROWE BMW of Nicky Catsburg were both on slicks, and had to crawl to the pits on the penultimate lap as the rain made Pflanzgarten and the run to the pit straight a river, allowing the Land Audi back through to the lead. On the final lap, another major position changed too, as Catsburg got past Rast to take second for ROWE Racing and BMW at Adenau Forst, leaving WRT with a third place finish, having led the final handful of laps. “The last half hour was tough to swallow, but the #29 was quicker and deserved to win. Third is good, but it still feels like a tough result,” concluded third-place finisher Robin Frijns, after scoring his first N24 podium. Coming home just off the podium was the #42 Schnitzer BMW, which had an off in the rain at the end, with the best of the Mercedes – the defending champion #1 Black Falcon AMG GT3 – fifth. 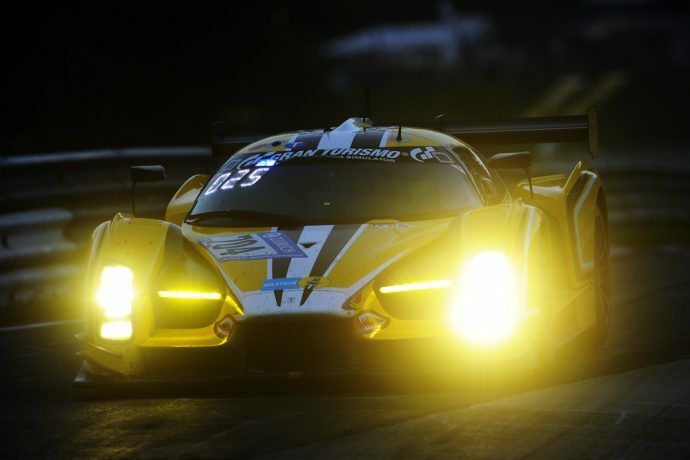 Prior to the final two hours, the race had settled down into a rhythm, with the #29 Land holding a dominant lead all evening on Saturday, through the night and Sunday morning while many of other front runners hit trouble, only losing the lead briefly during a pit cycle. 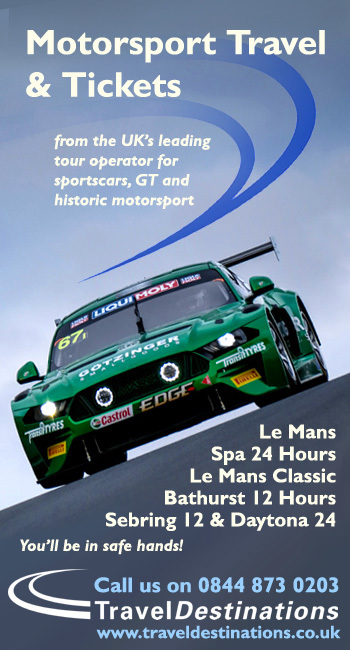 Of the other key challengers to fall by the wayside, the #10 WRT Audi crashed out early in the race, the #28 Land Audi had a puncture which caused terminal damage, the Pole-sitting #704 Glickenhaus crashed out on Sunday morning, the Falken and #911 Manthey Porsches also retired before the halfway mark. ABT Bentley’s highest finishing Continental came home three laps off the lead (the #37), after its trio had various offs and mechanical issues and #43 Schnizter BMW of Augusto Farfus shunted while running in the top five on Sunday morning, ripping the front-right wheel off completely after hitting the barriers hard. Behind, the #702 Traum Glickenhaus won the SPX class, and the #7 Aston Martin GT8 took home the honours in SP8, coming home a staggering 22nd place after Darren Turner steered the car to the flag on slicks. 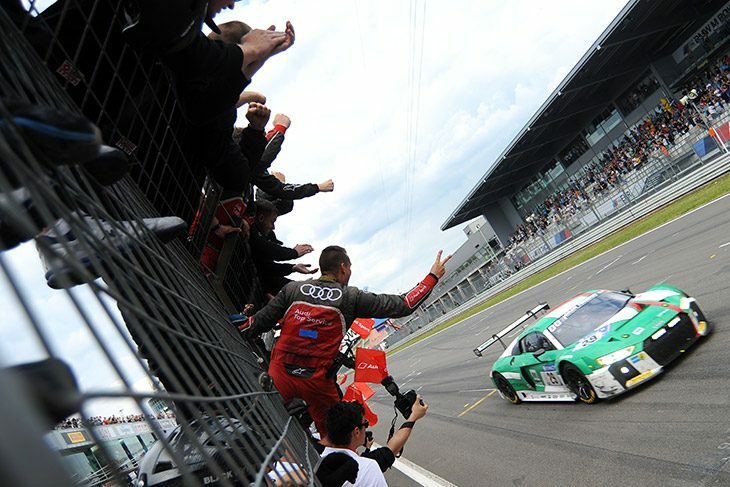 For Audi, it’s its fourth N24 win, and first since WRT won the race back in 2015 on the debut of the R8 LMS. It’s therefore the first win for Land, Connor Di Phillippi and Chris Mies’s second. 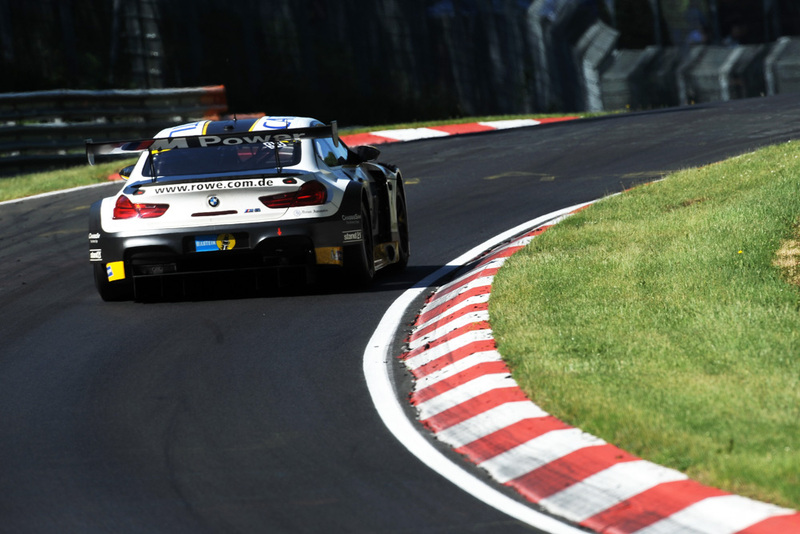 Markus Winkelhock takes his third N24 win. Di Phillippi becomes just the second ever American to win, the last being Boris Said back in 2005 with Schnizter. Kelvin van der Linde meanwhile, becomes the first South African, and African winner of the race. 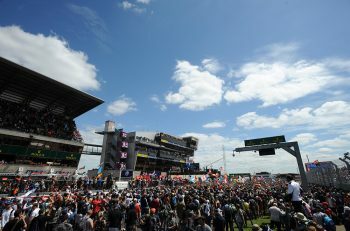 It was an astonishing finish, and the second year in a row in which the lead has changed on the final lap. 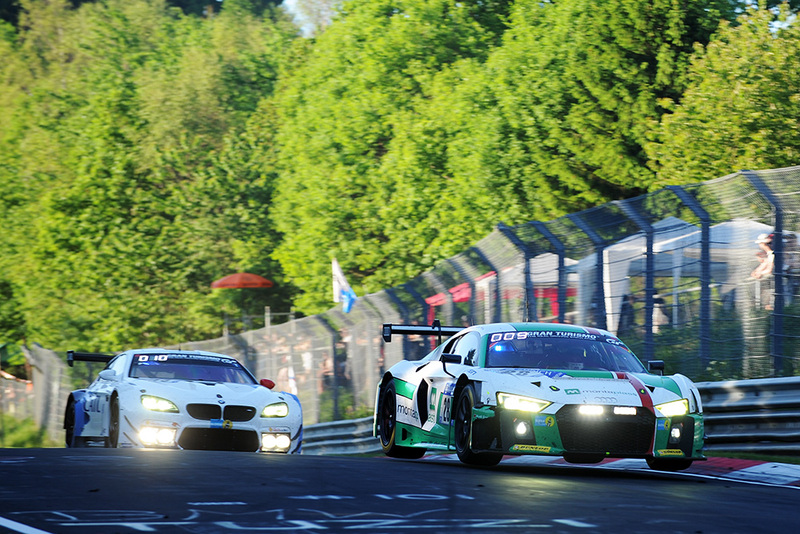 This year’s N24 had all the makings of a classic pre-race, and while much of it was a race of attrition with a dominant Audi 1-2 finish looking almost a certainty come Sunday morning, weather, once again threw a spanner in the works at the ‘Ring. 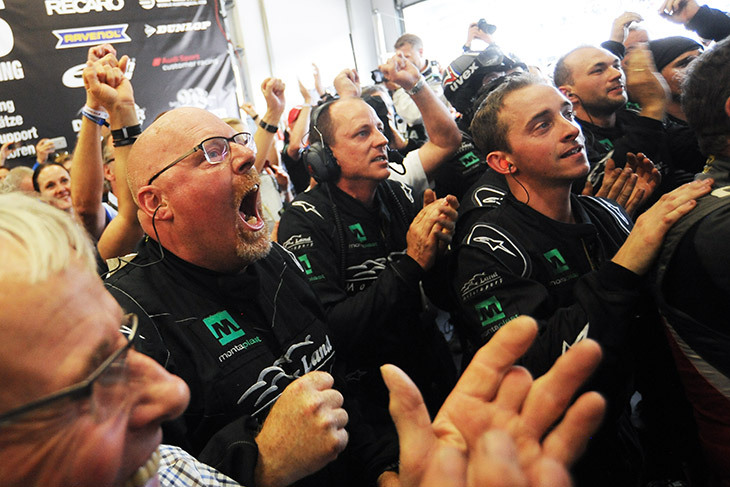 The result, one of the most memorable finishes to a 24-hour race in recent years.